By Bhawani Vikasak (I) Pvt. Ltd.
How Far is Bhawani Shivprakash Celebration? Bhawani Shivprakash Celebration is Bhawani Vikasak (I) Pvt. Ltd.’s latest residential project in Navi Mumbai. Project comes from a developer who has a history of using authentic materials and making use of space in a modern way. In Bhawani Shivprakash Celebration you will find not only beautiful but also high quality Apartments. It is conveniently located at Kamothe in Navi Mumbai city. 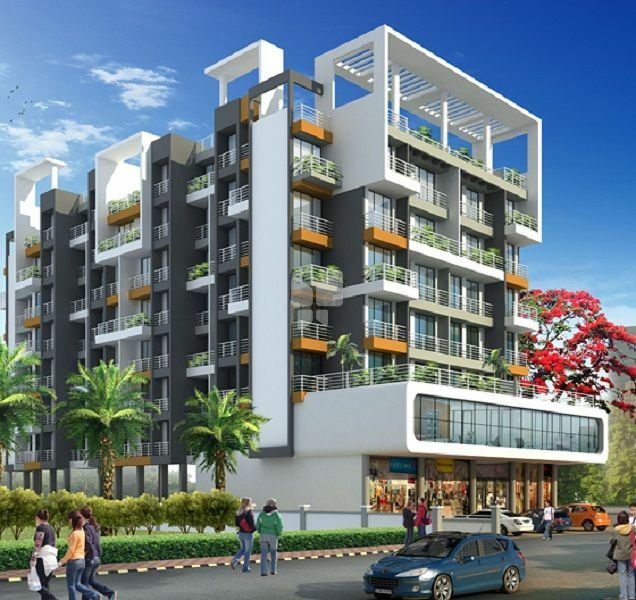 The project offers 1,2 BHK Apartments. Marbonite / Vertified Flooring 2ft x 2ft in full flat. Attractive Decoration of POP in living room. Attractive Glaxed tiles for full bathroom. Attractive Glazed tiles for WC. Best FRB in Bathroom & W.C. Concealed copper wiring with invertor provision with reputed brand modular switches. Heavy Aluminium window with powder coating. Decorative Salwood frame / laminated flush main and internal door. POP finish internal walls with Luster paint to all rooms. Quality granite window frame with marble base. Green marble WC bath door frame. External Water Proof acrylic paint to the building. Attractive Elecvation Treatment and decorative lobby. Cable connection wiring and Telephone connection wiring in the living room . Ac connection point and provision and exhaust fan provision in kitchen.